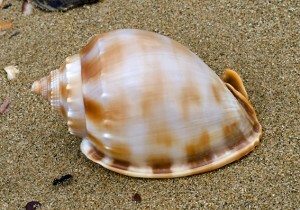 The Banded Helmet is one of the more common species of the Tun and Helmet snail family (Tonnidae) and most often seen washed up as dead shells or shell pieces. It lives in off-shore sandy areas down to depths of 50m and is frequently seen alive by divers at night and as the result of trawling and/or dredging activity. The shells of mature specimens may measure up to 90mm in length. When disturbed the animal can seal the shell aperture by a thin, semi-circular operculum attached to the foot. Although the diet of this species is unknown, some related species feed on heart urchins. Another species, the Giant Helmet (Cassis cornuta) from the Great Barrier Reef (and elsewhere in the Indo-Pacific) is a fully protected species in Queensland waters due to over-collecting in the past. Indo-West Pacific: Subtropical and tropical Australia.